Portadown boss Ronnie McFall has again insisted that Darren Murray will be remaining at the Shamrock Park club. Murray submitted a transfer request in June and Cliftonville have tabled a bid for the Belfast man as they aim to sign a replacement for Joe Gormley. Reds manager Tommy Breslin said that "nothing has happened as yet" following their approach for the striker. However speaking at Wednesday night's Irish Premiership launch, McFall said Murray would be staying at his club. The former Donegal Celtic player, 23, signed a two-year contract with the Ports midway through last season. "There are no rumours whatsoever. 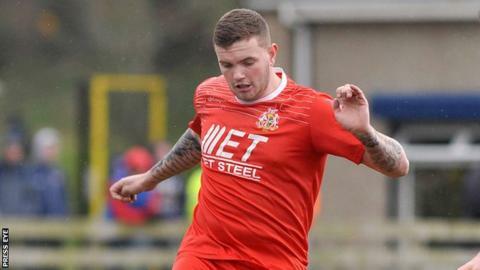 He's a Portadown player for the next two seasons," McFall told BBC Sport Northern Ireland. Cliftonville are on the lookout for a striker following the departure of their prolific marksman Gormley to Peterborough. It remains to be seen whether they will be further moves in the Murray saga before the conclusion of the transfer window at the end of this month. While the Reds have been frustrated in their attempts to sign Murray, Breslin's attack should be boosted in the coming weeks by the return to action of striker Stephen Garrett, who along with Chris Curran, Johnny Flynn and Marc Smyth, is nearing fitness after long-term injuries. "They will add to our strength from last year," said Breslin ahead of Saturday's Premiership opener against Glenavon at Mourneview Park. "One or two of them need a week or two to be back to 100% fitness. We'll not see the best of us probably until September but we've got a good squad. "We've got players who want to show that they are better than last year." After winning back-to-back championships in the two previous reasons, the Reds could only finish fifth last season but Breslin says his team will go into the new campaign in good spirits despite Gormley's departure. "We're looking for the likes of Stephen Garrett and Chris Curran and Davy McDaid, Jay Donnelly and Martin Murray to score a lot more goals this season. "But we're playing good football. We showed that in pre-season."